Just like any other parent I don’t want to see my child suffer. I also don’t want her to die from cancer and we are faced with a cure that is as nasty as the disease. I dream about the future, when all of this is over, when Vega is well. I have hopes for a future when families do not have to face the same hardship as us. When treatment is easier, quicker, or maybe even redundant because a cure has been developed. Kathi has written a blog of Vega’s story so far, from January 2012 to January 2013. These are Vega’s beads of courage. This was originally an American programme that was established to support children with long term and/or life threatening illnesses to feel a greater sense of ownership over their treatment. There is a British charity called Be Child Cancer Aware who brought these over to the UK and now many hospitals here are using them. The children get a sort of diary where you can tick off any treatments you receive and then at the end of the day or week you see your designated bead person – often the play therapist in children’s ward, to collect your beads. These beads were tremendously helpful for us, understanding what treatments would happen during the day, marking achievements and milestones but also hard times. These are Vega’s beads now, a little over 2000 if I remember correctly. There are many achievements beads too, when children are particularly brave or have overcome a great difficulty. Most treasures of all is the Purple Heart – the end of treatment bead. Vega still gets a bead now for every follow up. They are really great and Vega is very proud of them! Vega (wearing sunglasses) has now been off treatment for three and a half years. She will be nine on Boxing Day and in January it will be six years since she was first diagnosed with leukaemia. She is really well. We are very lucky as Vega has very little lingering affects from the treatment- her legs get tired easy but she attended a summer dance school and could easily keep up with all the other children. Her follow up appointments have moved from three monthly to six monthly and in just another year she will move into annual long term follow up. She recently cut off her very long hair and donated it to charity, as well as organising two bake sales for Children with Cancer UK with her friend Gracie this year. As she is getting older she is talking more and more about her experience having cancer and wants to help children still going through treatment. She seems to have coped with treatment remarkably well, both physically and psychologically. 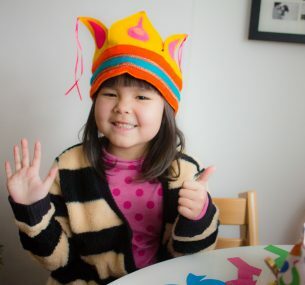 She is a very happy, healthy almost 9-year-old. 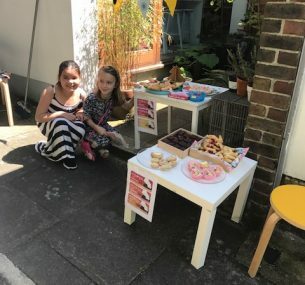 Vega and Gracie had a very successful bake sale on the weekend (27 May 2017). They raised an incredible £77. They were so very pleased with their sale and are planning another one already, we are also very grateful to all the lovely people who came to buy cakes. A very nice way to celebrate Vega’s three years in remission. Vega is doing well. She has some treatment related issues but has been off treatment since June 2014 now and is recovering slowly, but very steadily. I have continued to write my blog. I most recently wrote about the end of so many of our support services because Vega is not on treatment anymore. I am finding this very hard. Cancer does not only affect a family while a child is ill, but lingers into a family’s life for many more years. Vega turned six on Boxing Day. It was her first birthday in years when she wasn’t on steroids. I can not begin to tell you how much better the day was compared to the last few. I almost feel as if my calendar has been adjusted. New Years’ was a fly by affair, but today is weighty. I do remember so very well arriving at Kings A&E because Vega’s foot was sore and not actually leaving again until… well, we haven’t left really. We have no pictures of our two weeks at the Marsden, right after diagnosis. I think we were in too much shock to think about taking pictures. I feel somewhat sad and at the same time relieved that we don’t have any. This is a picture of Vega right after we returned home from the Marsden. She pretty much spent the first five weeks after diagnosis like this, crying on the sofa. Within days, our bright three-year-old had turned into this. You can see she is poorly, her eyes still swollen from all the IV fluids she had in hospital, her hair limp, her colour off. Vega refused to take liquid medication in the beginning so we crushed all her tablets and she took them with yoghurt, still very reluctantly though. But the tiredness was unreal, all consuming. Here she is lying on her marble run before she even had a chance to build it. Vega’s hair was just coming out, bit by bit. We had loose hairs everywhere – in our food, the sinks, washing machine, in the beds. It became unmanageable. Vega decided to cut it off and keep the remainder of her hair in her tin. After the hair was off, there was a lot of pirate playing in the house! 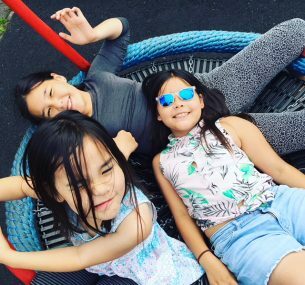 I could make this blog post a tribute to sisters. Lyra and Alys are such an important, irreplaceable part of Vega’s life. I found hundreds of pictures of the girls together, keeping each other company, keeping each other safe and loving each other. Vega was never alone, always able to reach out to them and they were able to reach out to her. The steroid weight gain was incredible. She went from 14 kilos to 20 kilos in six weeks. She was wearing Lyra’s clothes as none of hers fitted anymore. Whenever Vega was in hospital, I went with her and Ray looked after Lyra and Alys. Alys was small, still breastfeeding, and Ray had to spent many hours comforting a baby that didn’t have a clue why I suddenly disappeared again. We always, from the very start, made a point of including all the children, all of the time. Lyra and Alys were always visiting Vega in hospital, providing much needed distraction but also, very importantly for Lyra, demystifying the hospital and how well or not well Vega actually was. But nevertheless, the hospital can be a lonely, boring place. She’s pretending ‘to feed the animals in the forest’ (and no, there is no forest behind that door, just a bog). The tree house at Kings. Family time. Vega’s mucositis became so bad she was hospitalised and because she did not eat or drink for almost a week was eventually fitted with an NG tube. This was one of our worst hospital stays. Staying in touch via FaceTime and sending good night kisses to each other. Lyra gave Vega ‘a burial’. Both Lyra and Vega often say things like: “I am going to keep this toy/picture/stick until I die”. They think that means a very long time. Some days I felt I was totally seeing red. Literally. And sometimes still is, though not so often any more. Antibiotics, steroids, anti-sickness and painkillers. And then cereal (you should see what she has for dinner). It features in Children with Cancer UK’s calendar for 2013. Of course, sisters again. And who would have ever thought that we would feature in a calendar for a children’s cancer charity a year ago. It reminds me that life as you know it can change in the blink of an eye. She never looked as poorly as some of the other kids we saw at Kings or the Marsden. Then I found this picture. To me, here she really looks like a child that has cancer. Completely hairless. That cancer/chemo look. What a milestone and she knew it too. I carried her around for most of the first part of the year, steroid fat and all. My back is ruined. She still tires easily and often asks to be picked up and carried up stairs etc but it is getting better. I am also looking at Alys again. The ‘baby’ in the buggy, Vega on my back. Now people actually ask me why I trimmed her hair so short, if they don’t know us, or haven’t seen Vega all bald. 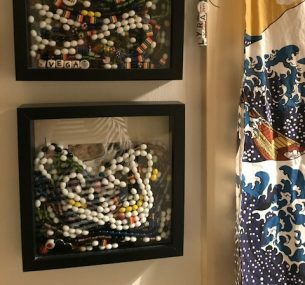 The string of 862 Beads of Courage is over eight metres long (about a metre per 100 beads) and it couldn’t hang next to our kitchen door any longer. So here it is, the Art of Survival. With two self portraits below, Vega and Lyra. Many things I have no pictures of but in my mind. And on we go for another year, collecting more pictures, beads and memories.